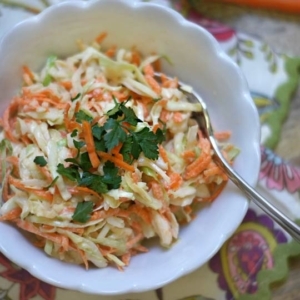 A creamy, dairy-free coleslaw, perfect for packed lunches and picnics. Combine all of the ingredients in a high-speed blender, starting with just 1 tablespoon of honey, and blend until completely smooth and creamy. Taste the dressing and add another tablespoon of honey to the mix, if desired, for a sweeter, more Southern-tasting coleslaw. To assemble, toss the dressing over a mixture of shredded cabbage, carrots, and any other shredded vegetables you like (such as raw beets or broccoli stems). Allow to marinate for at least an hour in the fridge before serving. You may not need all of the dressing for one batch, so leftovers can be stored in the fridge for up to 4 days.